When’s the last time you didn’t know where you were going? Not “lost,” which can be fun but seldom happens anymore because of spoilers such as cell phones and GPS gadgets. I mean embarking on a journey with no set itinerary. That happens every day on windjammer cruises in Maine. Old-fashioned sailing vessels are at the whim of wind and tide, and ship captains engage in an affable dance with nature whenever they leave port. 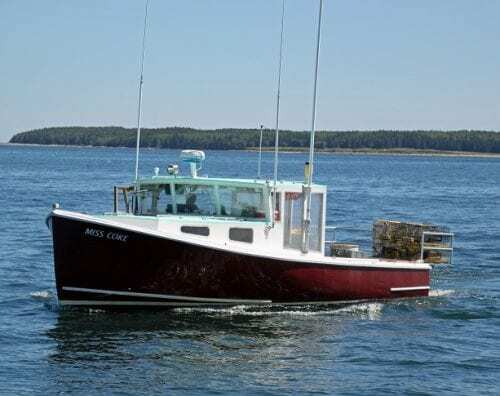 Home to more than 3,000 islands, the Maine coast is one of the world’s most scenic sailing areas, which drew my friend and me to the picture-perfect harbor of Camden, and the good ship Angelique. With her tall wooden masts and furled ocher sails, the Angelique was easy to spot. 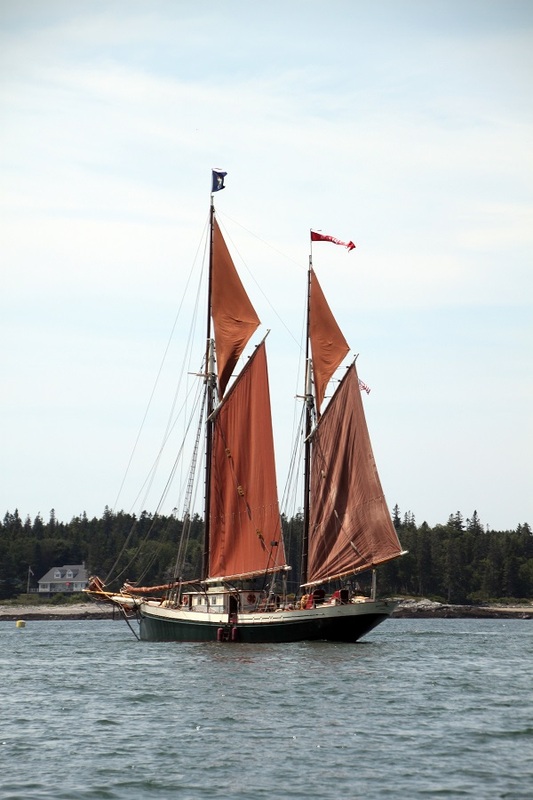 Built in 1980, the 132-foot ketch was modeled after the 19th-century vessels that hauled granite, lumber and other goods back in the day. Those ships carried sails treated with reddish-brown tannin to prevent mold; on the Angelique, the sails are an historic touch. Although she looks like the ancient windjammers, the Angelique is outfitted with modern safety features and amenities such as showers and heads (toilets). The 16 cabins below decks are small, but have sinks, comfy double bunks, reading lights, USB outlets and room to stow suitcases. Our first morning aboard we gathered on deck with our fellow passengers to exchange waves with people on fancy yachts and lesser vessels as our ship weaved her way toward the harbor mouth like a celebrity quietly leaving a dull party. Humming the tune from Camelot, “What do the simple folk do. . . ,” I settled myself on a seat in front of the elevated helm, where I could listen to captain/co-owner Dennis Gallant call nautical commands to his crew and passengers eager to learn the ropes, er, lines. 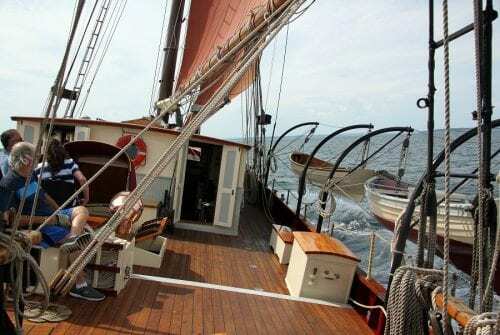 Soon the massive sails (seven in all) filled with wind and the graceful ship responded, carving through the waters of Penobscot Bay with a gentle, rhythmic bobbing of her bow. He and Candace now own the Angelique, and relish earning a living at something they love. Their passion is shared by the crew, and quickly rubs off on the passengers. 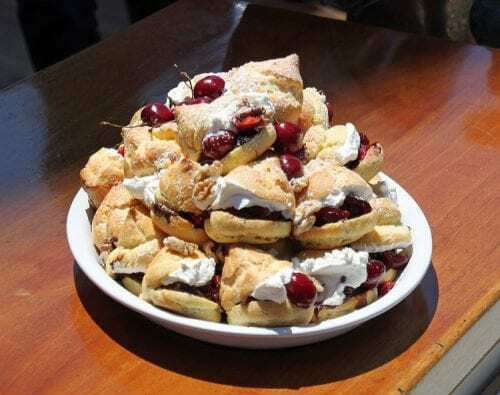 Our good fortune became even more tangible when our first lunch was served—tossed salad, clam chowder, biscuits and cream puffs for desert–all made from scratch. It was one of many extraordinary meals to emerge, as if by sorcery, from the tiny galley. The chef shops for locally sourced ingredients before each voyage and tailors his menus accordingly. Lobster was, of course, on my mind. It was hard not to think of it as we passed through masses of colorful lobster trap buoys and watched lobstermen setting and emptying traps. Soon, Dennis promised. 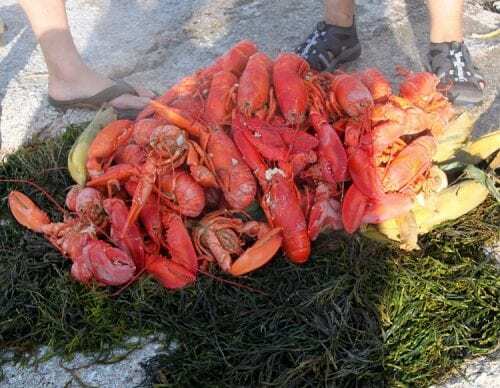 Every cruise has a lobster bake; ours was coming. The first afternoon passed quickly as we chatted with our fellow passengers; watched for whales, bald eagles and porpoises; and lent a hand with the lines. Well before sunset we anchored in Mackerel Harbor, a quiet cove on Swans Island, which is home to 300+ lobster fishing families. The following morning we sailed over to Bass Harbor and boarded a chartered bus for a tour of Acadia National Park on Mt. Desert Island. 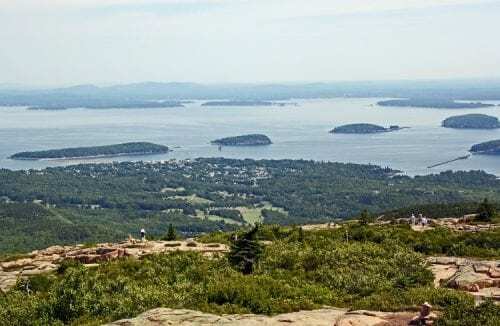 From the top of Cadillac Mountain, highest point on the North Atlantic seaboard, we looked down on the popular tourist town of Bar Harbor and the islands offshore. Our driver entertained us with the history of the island and “insider” stories of famous local families (Vanderbilts, Rockefellers) and celebrities (Susan Sarandon, Martha Stewart, Tom Selleck) among the summer set. Back on the Angelique, we sailed west under a brilliant blue sky. 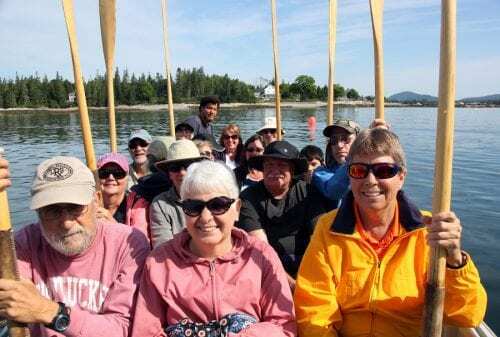 Dropping anchor off Bear Island, we rowed the dinghies over to the granite shore, where the crew steamed fresh corn and lobsters over a driftwood fire. At last! Lobster never tasted so good. . . . 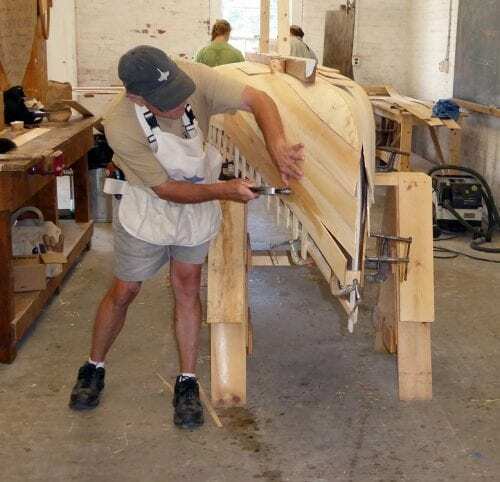 The next morning, after a breakfast of heavenly homemade crepes, we stretched our legs with a visit to the Wooden Boat School, where students were building a dory. As we sailed through Eggemoggin Reach, crew members went aloft to lower the tops of the masts so we could pass under the Deer Isle bridge. The Angelique seemed impatient with this and, when we reached open water, embraced the 25-knot wind like a dowager raising her skirts to run. Ten knots (11.5 mph) seemed a blistering pace as she heeled to starboard and the water became a blur. Our skipper grinned ear to ear, especially when challenged to a friendly race by the 145-year-old Louis R. French, the country’s oldest commercial sailing vessel. 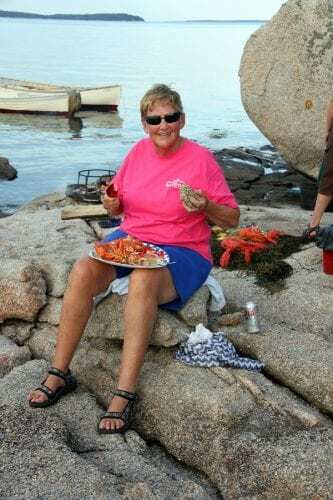 Eating lobster on the beach – it doesn’t get any better than this! Rounding Isleboro Island, we anchored in Gilky Harbor near Scout, a 148-foot luxury yacht owned by one of Maine’s billionaire summer folk. Kirstie Alley and John Travolta are among the celebs with homes on Islesboro, but we agreed that no finer fare was being consumed on the island than the pork roasts our chef had cooked overnight, served with handmade pasta and salads. In the morning we would sail into Camden and go our separate ways, but as the sun set we lingered on deck and in the salon to reflect on our windjammer experience. Richard Lubell, a social studies teacher from Brooklyn, NY, belongs to a yacht club with 65 vessels sailing in Long Island’s Jamaica Bay. “I lived in Boston for 10 years and fell in love with Maine, where I feel closer to sky, to God, to nature,” he says. “I marveled at the windjammers for many years and, when it came to a choice, I liked the shape and size of the Angelique. I’ve developed tremendous respect for our skipper and crew. The crew’s average age is about 23; I’ve sailed for 25+ years and they know so much more than I do. 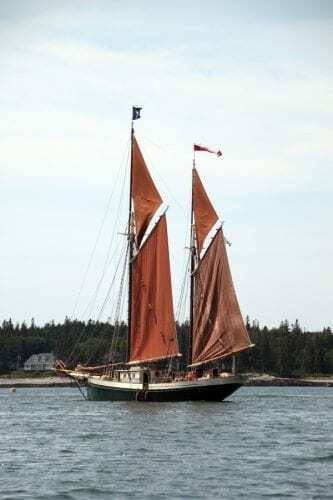 If You Go The Angelique (sailangelique.com) is one of nine tall ships, all privately owned and operated, in the Maine Windjammer Association (sailmainecoast.com) fleet, based in Camden and Rockland. Five are National Historic Landmarks. During the season (late May to mid-October), cruises range from overnight to 11 days, and are priced from $250 to $1,995 per person, all inclusive. There are themed trips (birdwatching, wine-tasting, photography, full moon, etc.) and cruises during tall ship races, parades of sail or other events. Major airlines fly into Portland, ME, and Boston, MA, with Cape Air commuter flights connecting from Boston to Rockland. Ground transportation is by limo, taxi or rental car. The windjammer association offers packages with local hotels for pre- and post-cruise stays. We spent a delightful rainy morning in Rockland’s Farnsworth Art Museum (farnsworthmuseum.org), home to an extensive collection of art by N.C., James and Andrew Wyeth, along with works of nationally prominent artists whose careers are associated with Maine. As the rain continued, we drove south to the Owl’s Head Transportation Museum (owlshead.org). The weather cancelled the daily antique plane and auto demonstrations, but we enjoyed browsing the indoor display of more than 150 cars, planes, motorcycles bikes, carriages, etc. The non-profit museum hosts several festivals that draw collectors and vehicles from all over the country.